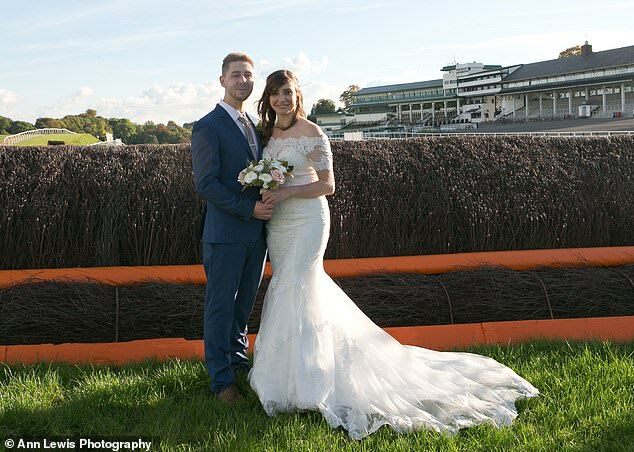 A thrifty bride has revealed how she shaved £20,000 off the cost of her wedding by cashing in vouchers, using artificial flowers and tying the knot on a racecourse. 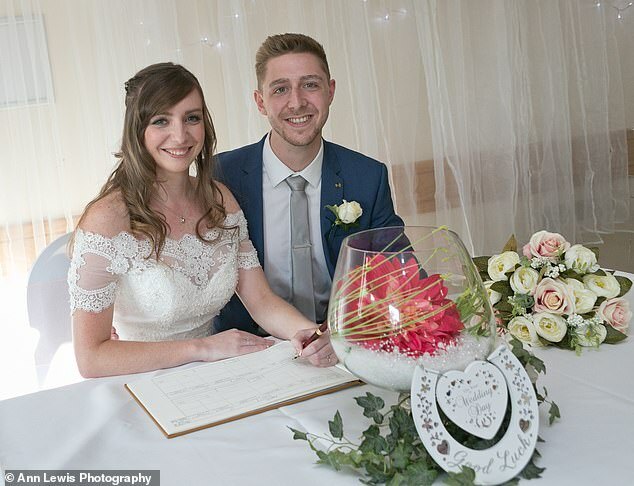 Katie Watkins, 29, and her husband Luke, from South Wales, knew they wanted to keep costs for their nuptials below £10,000 so they could save up to buy their own home. 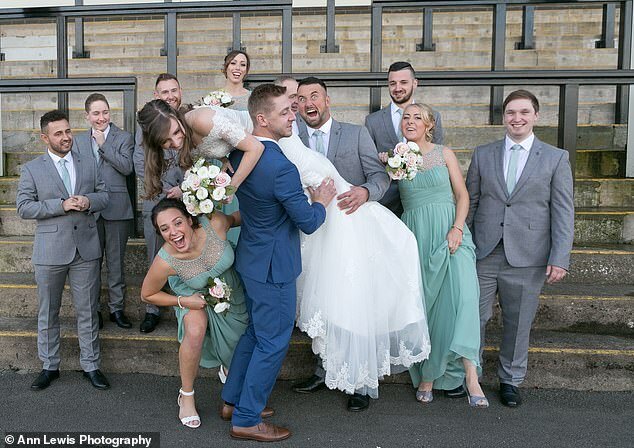 With the average UK wedding coming in at £27,161, cutting costs was no mean feat – but Katie managed to spent just £8,000 on her big day. The blogger, who writes under the moniker Katie Saves, told FEMAIL: ‘We didn’t do everything on a shoestring budget, we wanted to compromise and didn’t waste money on things we wanted to have because we were expected to. Katie, who works as a financial assistant, kept track of her day-to-day spending in one spreadsheet and her wedding budget in another. The 29-year-old kept all her receipts and updated her budget weekly, and kept a physical diary as well. To save up for the big day, she and her husband stopped eating out for dinner and started taking packed lunches into work, and decided against taking any more city breaks. The short term sacrifices meant that the pair got married in October 2016 – less than a year after Luke proposed. And just six months later, the newlyweds managed to buy their own home – before having a daughter together, Elise, who just turned one. Katie originally wanted to get married in a beautiful country house, but the one she was considering charged £6,000 for just 30 guests. 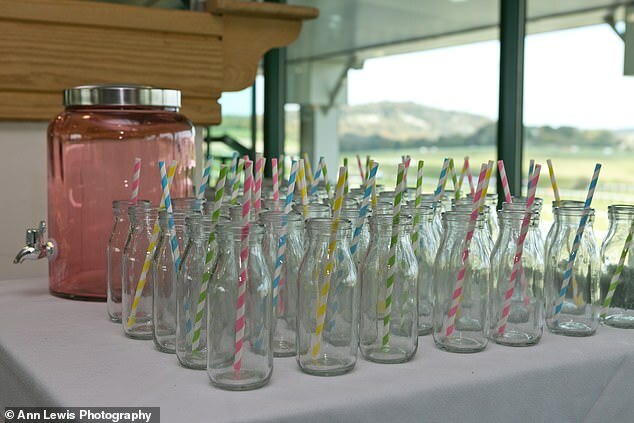 Instead the pair bucked tradition by getting married on a racecourse – cutting costs considerably, without losing out on the fun. Many brides consider fresh flowers to be a must at their weddings, but for something that isn’t going to last it’s an easy expense to cut. Instead of ordering from a florist, Katie bought artificial flowers from The Range and four rose trees from Home Bargains which she decorated with battery-operated fairy lights. 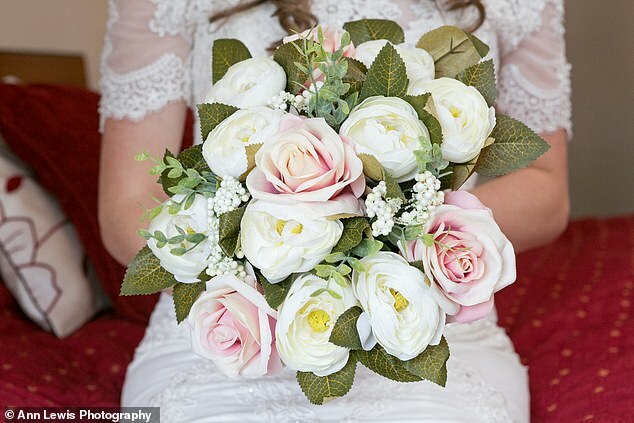 For the bouquet and buttonholes, she turned to Facebook where she found someone who specialised in creating them from artificial flowers – and got plenty of compliments on the day. Neither Katie or Luke particularly enjoy cake, so they decided against forking out £300 for something they wouldn’t eat themselves. 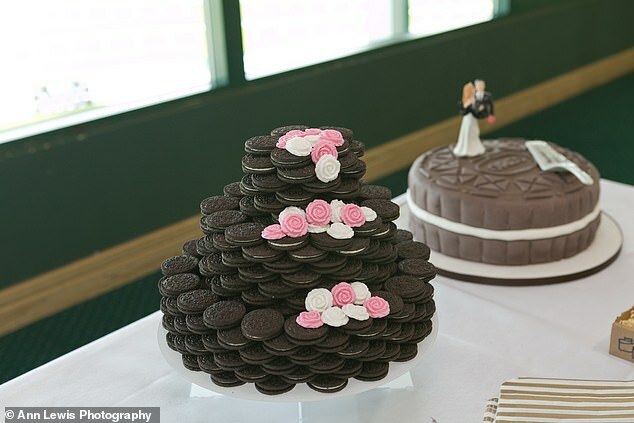 Instead they bought packs of Oreos and a cake stand, sticking it all together with icing and serving it up with milk bottles. Although Katie originally tried a bridal boutique for her dress, she wasn’t sure about any of them and ended up going to a bridal outlet. She immediately fell in love with a £600 dress – half the price of the one she had been considering before. She bought it off the hanger, and didn’t even need any alterations. 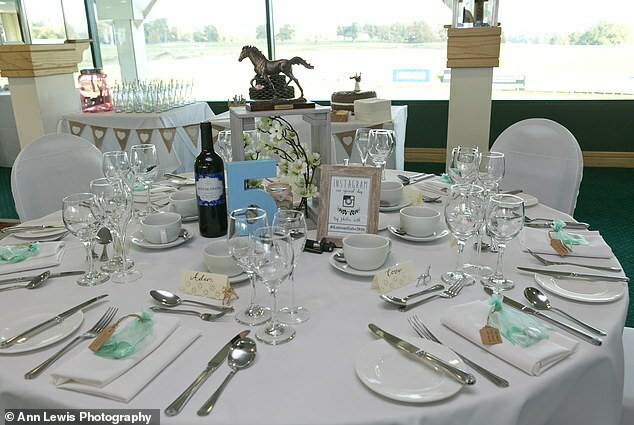 Chepstow Racecourse wanted £25 for a bottle of wine on each of the tables, but Katie managed to save some serious cash by shopping around. She got a deal on 24 bottles of wine for £67 from Groupon, and then paid £12.50 per bottle as the venue’s corkage fee. For those wanting to save even more money, skipping out on buying outfits for those in your wedding party is an obvious solution. But if you do decide to splash out, Katie advises you head to the high street rather than a bridal boutique. She bought nine suits from Burton, who were doing a deal where you buy a suit and get a pair of shoes for just £99. 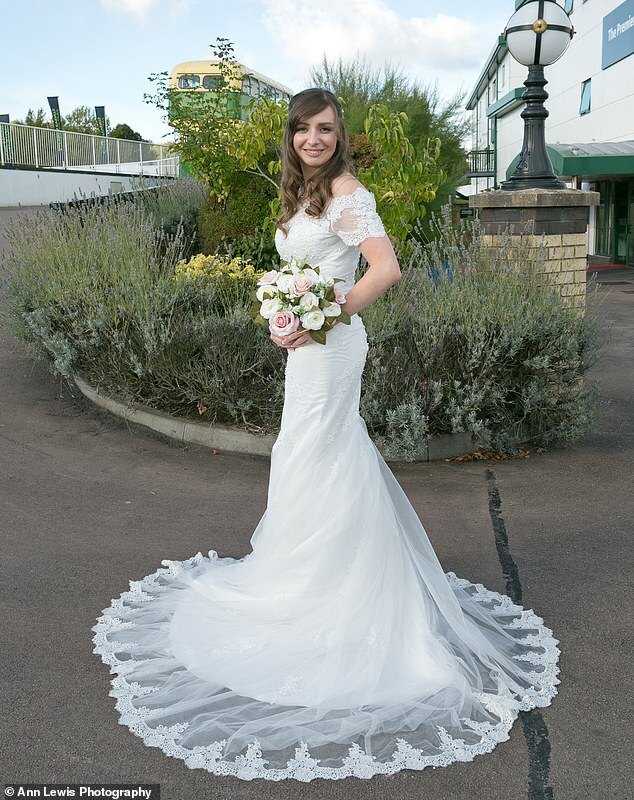 The thrifty bride then signed up for the store card, saving herself another 20 per cent – which worked out at nearly £180. She then bought her three bridesmaids dresses from Very, using a buy now pay later service, paying them slowly off as the big day approached. Another tip she recommends is searching for discount codes on everything and using up vouchers. Katie and Luke created all the stationery at the wedding themselves – from the invites, to the name cards and seating chart. 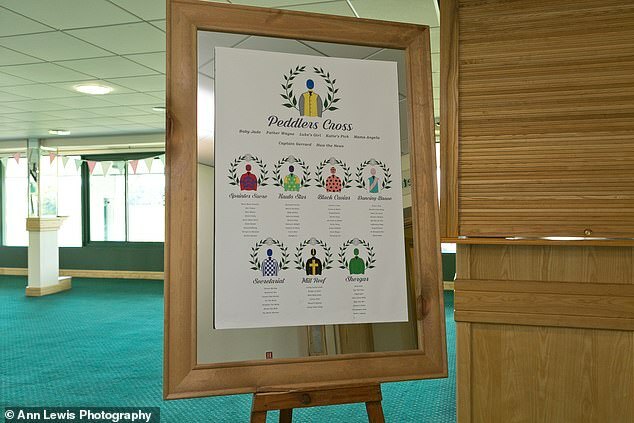 As the wedding was race card themed, the pair had a great deal of fun coming up with nicknames for all of their guests using real horse names.